It's Friendship Day again. Time to appreciate that person who has shared your joys and sorrows, tried to make your going a little less heavy and stood by you through thick and thin no matter what. And what better way to do so than some nice songs? Songs are for all occasions and Friendship Day is certainly not excluded. So here we bring to you a list of popular songs to sing and play on Friendship Day. All these songs are related to the theme of friendship and are appropriate for Friendship Day celebrations. What's better, you can also get the lyrics of these songs right here, and for free. You may quote these on Friendship Day Cards or e-mails. So get going! Pull up your socks and make this Friendship Day a memorable time for you as well as your friends with these beautiful Friendship Day songs. 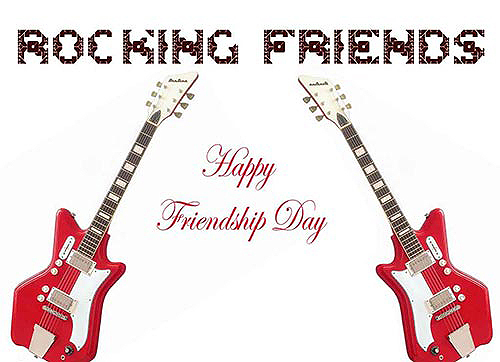 If you like our collection of Friendship Day songs, please click here to refer this page to all your friends and include them all in your merriment. Spread the cheer to all. Happy Friendship Day! Go over the poignant lyrics of heartwarming songs on friends and friendship belted out by some of the finest singers the world over. You and your friends will identify yourselves with many of these songs that bring out the right tunes of friendship very beautifully. Dedicate any of these Friendship Day songs to your friend! Mm, gonna try with a little help from my friends. I can't tell you but I know it's mine. ...with a little help from my friends. Thank you for being a..